The protector of time that governs the computer's timer. It manages the "Time" and "Space" of all computers and networks, and if it is between 1900 and 1999, it is able to freely advance and rewind time. Because it possesses an extremely dangerous, terrifying ability, it always maintains a neutral standpoint, and doesn't participate in the conflict between Vaccines and Viruses. For that reason, it is said that if it ever tilts toward either side of the balance, the Digital World will collapse. Its Special Move is destroying the "time" flowing through the opponent's body (Chrono Breaker). It is impossible for a Digimon whose "time" was frozen with this attack to recover. 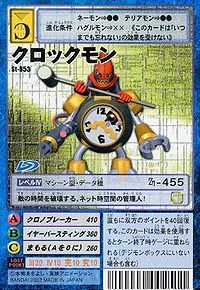 An alarm clock-shaped Machine Digimon. It has the ability to control space and time, and this ability seems like it could cause the Digital World to collapse!! Because it possesses such a dangerous power, it never participates in battles. Adult level, Data attribute, Machine type Digimon. Its Special Move is Chrono Breaker. — Digimon Tamers: "Friend or Foe!? The Legendary Tamer Akiyama Ryo"
Anime/Manga Digimon Tamers: "Friend or Foe!? The Legendary Tamer Akiyama Ryo"
Chrono Breaker  クロノブレーカー Korono Burēkā Wears away its foe's bodies by stopping time. 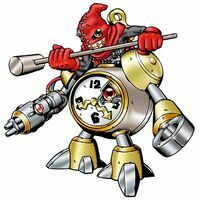 A Clockmon worked on a clockwork cloud plane with a Hagurumon in the Digital World. In episode 40, "Evolutionary Radiance - Shining Evolution" when Culumon unleashed his Shining Digivolution power, Clockmon and Hagurumon felt his energy along with the rest of the Digital World . 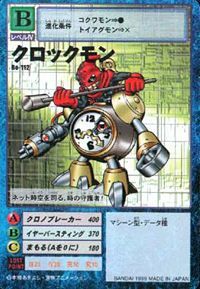 A Clockmon provided with the top humanoid portion appears during the final battle against Darkness Bagramon to form Shoutmon X7 Superior Mode. 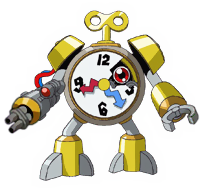 Clockmon is the partner of the Old Clock Shop Man. Unlike normally, this Clockmon lacks the human-shaped top portion of the regular Clockmon and only has the clock-shaped lower part. By using Clockmon's power, the Old Man was able to travel to other worlds to find help in the battle against Quartzmon. 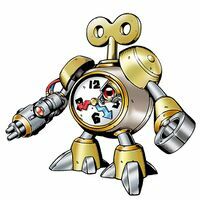 Clockmon can also create virtual spaces, protect areas from turning into DigiQuartz and stop the flow of time. It is unknown where Clockmon came from and where it gained its remarkable power from. Clockmon is the game-time clock on the upper-left hand corner during gameplay. Clockmon evolves from Candmon with 6+ DP. Clockmon evolves into Blikmon with 0-7 DP or Death Meramon with 8+ DP. Clockmon is an NPC in Time Village who sells items. Clockmon can be found at Asuka Dum Dum Factory, and gives the item Multi Crest. Can be evolved from Solarmon if above level 33, quality 40, and Machine EXP 6000, or can be found at Chaos Brain. Can evolve to Knightmon if above level 40, attack 200, and defense 180. An NPC Clockmon also appeared as the member of Gaia Origin during the Quest Mission "The Challenge From Gaia Origin!". 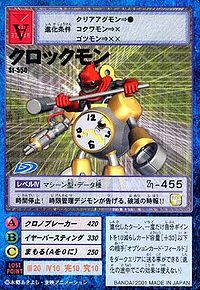 Clockmon can only be obtained as a collectible card. 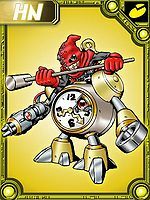 Clockmon is only obtainable as a collectible DigiCard. Evolves from Toy Agumon or Kokuwamon. Can evolve to Knightmon or be Jogressed with a compatible Digimon to get Andromon, Big Mamemon or Waru Monzaemon. Evolves from Toy Agumon or Kokuwamon. Can evolve to Knightmon or be Jogressed with a compatible Digimon to get Cyberdramon, Big Mamemon or Waru Monzaemon. Time Freeze! 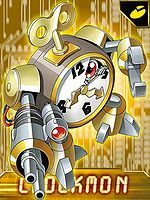 This time control Digimon alerts you with its alarm of destruction!! The supervisor of the Net's space-time, it destroys the opponent's flow of time! It governs over the Net's space-time, the protector of time! This page was last modified on 8 April 2019, at 21:04.